This little predecessor of the piano not only packs a punch with its versatility and bright sound, but of all the period instruments it's probably the best known to modern audiences. It's one of the few historical instruments that's made a resurgence and is played regularly with modern orchestras. It's definitely the only historical instrument I can think of that's made an appearance in jazz, folk, and even pop and rock groups like The Beatles, The Beach Boys, and Jimi Hendrix (to name a few). This “mini” piano ancestor is called a harpsichord, but minus the pedals, and a few other mechanisms, it's really more closely related to the lute! 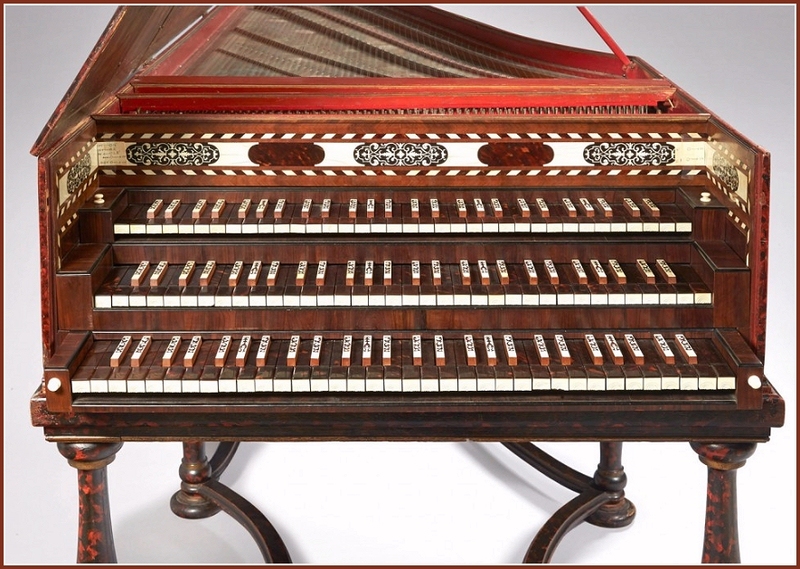 Harpsichord: the original "Mini Me." The clavicytherium, an upright version of a harpsichord, found in Praetorius's Syntagma Musicum. Unlike the piano, it has a smaller range (we use 5 octaves for Chicago Stories) and has two or more manuals (or rows of keys) stacked one on top of the other like stair steps. Manuals can create a different sounds and tone colors, depending on the instrument. Perhaps the biggest and most defining difference is how it makes the sound. Modern pianos have little hammers inside that, when you press a key, hit a string to make the sound. When you release the keys, a damper touches the strings and the sound stops - unless you press a special pedal with your foot that can sustain the sound. The mechanism in a harpsichord, however, actually plucks the strings. A jack with a small piece of quill (or other synthetic material) called a plectrum raises up to pluck the string. The strings vibrate and create a cloud of resonance until the jack comes back down and dampers the string with a small piece of felt. A major component to making great Baroque music is to make the most of contrasts: loud vs. soft, short vs. long, accent vs. no accent, light vs. dark, etc. The harpsichord “technically” can’t create dynamic (volume) contrasts in the same way that a wind or string instrument can with their air or bow. But a great harpsichordist can get around dynamic limitations by the way they touch the keyboard. On the modern piano, the softer or harder you push the keys, the softer and louder the sound is, respectively. Ironically, the softer you push the key on a harpsichord, the bigger the sound. That’s very zen. They can also vary dynamics by adding notes, playing notes or chords short or long, and coupling manuals so that, while the keyboardist touches only one manual both manuals sound at the same time. The top manual has a softer oboe-like sound. Composers, like the great J.S. Bach, will sometimes notate if they wanted that one used, as he did in his Goldberg Variations. There's also a cool stop called the "lute stop," which makes the harpsichord sound more like - you guessed it - a lute. 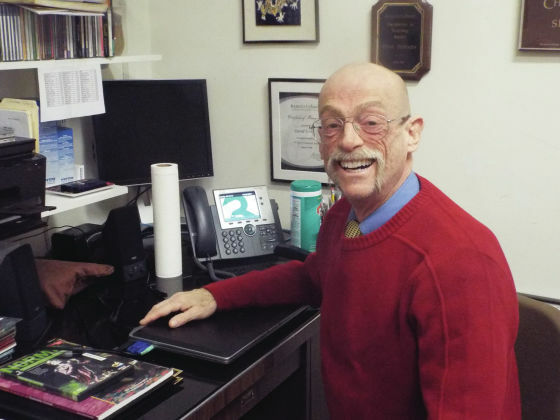 Our harpsichordist and national treasure, David Schrader, talks about how he “feels for the pluck” as he presses down on the strings. All touches and articulations, he says, are possible on the keyboard. David Shrader plays Fandango by Antonio Soler. David Schrader plays his L.G. Eckstein harpsichord, which he will use for Chicago Stories. Anyone who has lived in Chicago for an extended amount of time, and that loves or plays classical music, has likely heard of or crossed paths with David Schrader. He's a pianist, organist, and forte pianist, and is known by many in the classical music world beyond Chicago. His legacy goes back to playing under the great Sir Georg Solti who directed the Chicago Symphony Orchestra from 1969-1991. Yes, the CSO has showcased the harpsichord for many years, and still does today! For Chicago Stories, it has been great for Amos and Heidi to learn about the harpsichord's versatility and how to write a harpsichord part the way it would have been back in the day: with a bass line to be played by the left hand and figures (numbers written above the bass note) that tell David what chords to play so that he can improvise notes with his right hand. When asked what instrument was the favorite to learn about, Amos was adamant that it was the harpsichord. If you wonder just how versatile the harpsichord can be, in Chicago Stories, it can swing with the jazz greats and empower the voices of women.